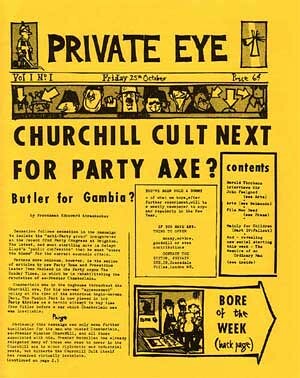 Tony Rushton has been art director of satirical magazine Private Eye for 49 of its 50 years. 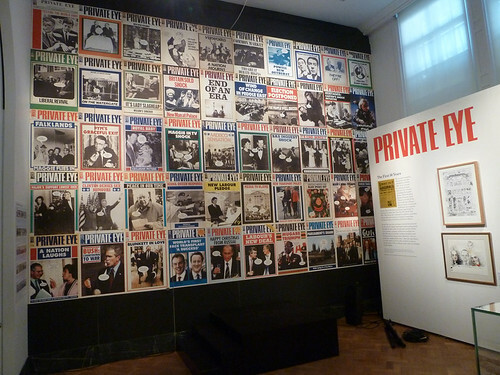 The fortnightly is celebrating its half-century with a small, free exhibition in two rooms at the Victoria & Albert museum. 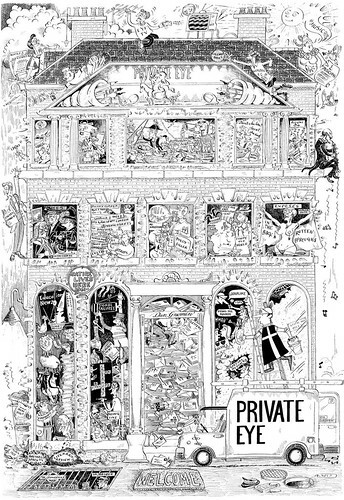 I interviewed Rushton prior to the opening of the show, close by a wall covered with 50 of its distinctive covers (below), writes John L. Walters. ‘I can lay claim to all of those,’ said Rushton (below), pointing out that most of them had been designed in a few hours. 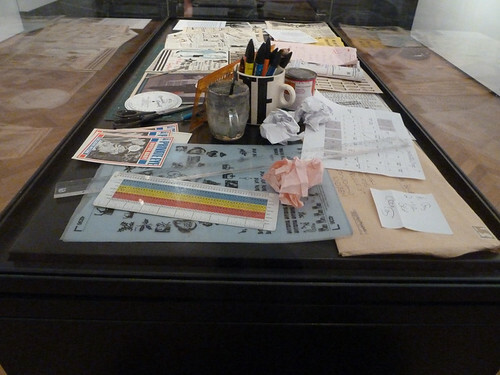 (Which possibly a luxury, compared to the deadlines given to the Eye’s cartoonists.) And 49 of the covers have that unmistakable masthead (top), designed in 1962 by Matthew Carter. 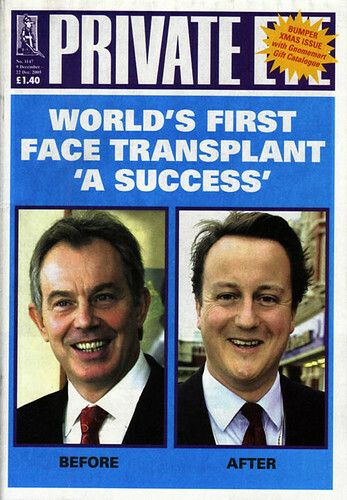 Eye: ‘Has there ever been an attempt to change it? Rushton: ‘Matthew was a friend of Nicholas Luard who owned the Establishment club. And in the early days we were producing the magazine in the waiters’ changing room there. So we would use the office during the day, and then the waiters would come in and change and we would have to leave. ‘It goes through ups and downs. When it first came out it was very of the moment. Now, because there’s so much nostalgia for the 1960s, it’s very fashionable again. 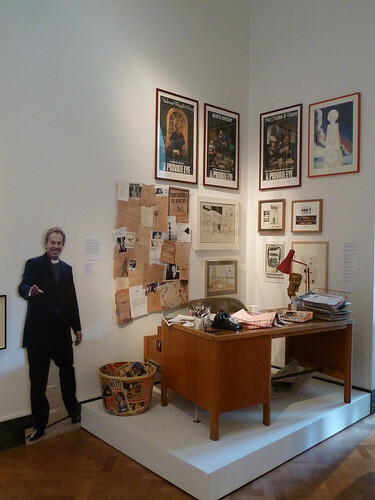 The show includes an ‘installation’ (above): the editor’s office, complete with phone and a wastebin full of copies of Sir James Goldsmiths’ magazine Now! 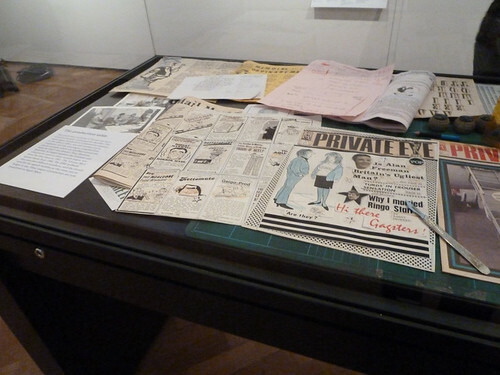 Private Eye’s early design methods are represented by a glass display cabinet (above and below) littered with the arcane tools of 1960s and 70s magazine production: scalpel, sheets of Letraset, golfball typewriter heads, type rule, etc. 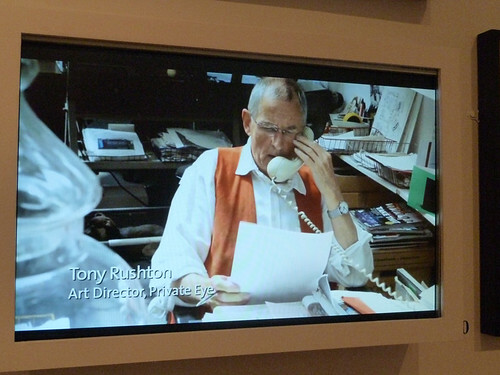 More about Tony Rushton and Private Eye later this year. A very happy 50th anniversary to the (other) Eye. Eye is the world’s most beautiful and collectable graphic design journal, published quarterly for professional designers, students and anyone interested in critical, informed writing about graphic design and visual culture. It’s available from all good design bookshops and online at the Eye shop, where you can buy subscriptions, back issues and single copies of the latest issue. Eye 81 is on press.